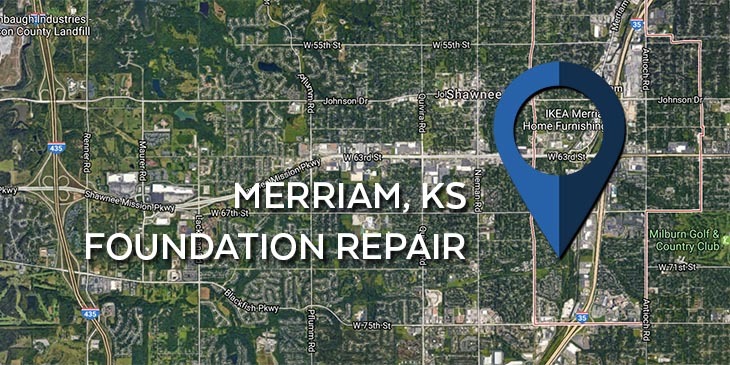 The residents in Merriam, Kansas know that if they have any sort of foundation problem in their home, they can come to KC Pro and our professionals will take care of the issues. We proudly service foundation repair for the community here which has a population of around 11,000, according to the 2010 census. It is located in the northeast portion of the state of Kansas in Johnson County. The residents in Merriam, Kansas know that our professionals keep the customers satisfaction their number one priority while working on your home. KC Pro is a trusted company for foundation repair and in the surrounding areas, so let us know about your foundation problems. Many times you may now know the full extent of your foundation problems in your home, so you need to have a professional come and inspect the situation. Generally if you see any commons signs of foundation issues you should call a professional. Signs to look for are: sticking doors or windows, cracks in your walls, leaning chimneys, cracks in your foundation, or bowing basement walls. If you find any of these in your home, then you should contact the professionals at KC Pro as soon as possible. The longer you prolong taking care of your foundation problems, the more foundation problems will appear and add more and more damage to your home. Don’t let the stress of a failing foundation bother you, call us to come get rid of your problem. We use only the best foundation repair products in the industry. Everything we use is provided by Earth Contact Products. ECP is widely recognized as the industry leader in the manufacturing of foundation repair tools and products. When you pair our expert contractors with these excellent tools the result is a long lasting and satisfying repair. We will use helical and steel piers to underpin you home, relieving foundation stress and providing structural support. Often times foundation damage comes hand in hand with water seepage. The longer you leave foundation cracks unattended the higher your chances of moisture entering your home. If you are ever in need of foundation repair and basement waterproofing give us a call today! Not only does KC Pro provide you with foundation repair, we also have the service of basement waterproofing as well. We have a variety of waterproofing services that range from exterior waterproofing to wall crack injections. Our professionals want to help you out so that your home is a safe living environment for you and your family. Don’t hesitate to have us come in and take care of your basement waterproofing problems. Since we are a full foundation repair contracting service; we do it all. Whatever your foundation repair needs are just contact us at KC Pro and we will be there to help.